I absolutely can not believe that summer is over and it’s back to school for the little and not so little ones. Back to school was always bittersweet for me. I loved summer and having my girls home (we did lots of beach, pool, cousin time, and boardwalk). I loved the carefree schedule of not worrying about bedtimes, getting everyone up and out the door early was never something I looked forward to. Summer was fun! But, on the other hand, I love fall and everything that it brings with it. I love the change in weather (at least the slight change that we see here in CA), I love long evenings at home with a fire going and candles burning. And, contrary to how much I loved summer, I did enjoy getting back into a schedule. Back to school typically also meant back to soccer practice, basketball, tennis, piano, and dance class (I sure am glad those activities took a break in the summer). It meant a homework schedule. And, it typically always meant we had some crazy schedule conflicting afternoons. Three daughters meant three different after school schedules. And then I still had to get dinner on the table for the family!! I belong to a small food blogger’s Facebook group, and we decided that it would be fun to do an every-other-week Round-Up of some of our favorite recipes. Being that it’s back to school season, it only made sense to share some quick and easy family friendly recipes with you. Some are quick and easy to prepare, some make use of your slow cooker, while a few of them are make ahead type recipes, such as my Ricotta and Spinach Stuffed Shells. 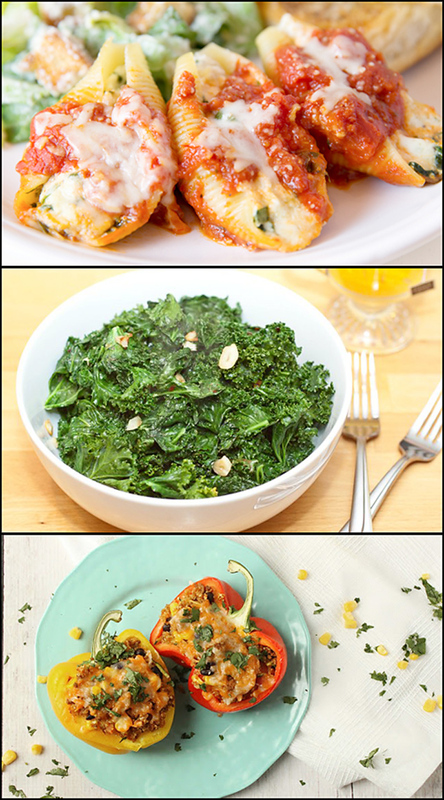 Above: Ricotta & Spinach Stuffed Shells from Joy in Every Season. Garlic Kale from Tracy at Served from Scratch. And, Mexican Style Quinoa Stuffed Peppers from Chrissie at The Busy Baker. The Ultimate Grilled Cheese from Pie at Eat to Your Heart’s Content. Cheese Pigs in a Blanket from Whitney at That Square Plate. Baked Tortellini from April at Girl Gone Gourmet. Above: Chicken Fajita Wraps from Tina at The Gluten-Free Foodsmith. Shepherds Pie from Karen at Karen’s Kitchen Stories. Eggplant Parmegian Towers from Linda at The Food Huntress. Pulled Chicken Sandwiches w/homemade BBQ Sauce from Megan at Strawberry Blondie Kitchen. Skillet Vegetarian Beef-a-roni by Byron at Pretty Practical Pantry. Twisted Tuna Casserole by Diane at Homemade Food Junkie. Easy Tomato Sauce by Rosemary at An Italian in My Kitchen. Cook pasta shells according to package direction (undercook by 1-2 minutes), drain. Saute chopped onion in a little olive oil, add in crushed garlic. When onion/garlic are tender and translucent, add in a bag of fresh spinach (chopped). Cook until spinach is wilted. In a large bowl combine ricotta, parmesan, ½ c. grated mozzarella, egg, nutmeg, salt & pepper. Mix until well combined. Add spinach mixture to cheese mixture and combine. Pour a little pasta sauce in bottom of casserole dish (I made two 9x11' pans). Gently stuff the pasta shells with cheese mixture and place open side up in saucy pan. Top with more sauce, some grated mozzarella cheese, and a sprinkle of parmesan. Cover with foil. **makes 2 casseroles. Enjoy one tonight and freeze the other. I certainly hope you enjoy some of the recipes shown above and will take the time to go and check out some of the other recipes that these amazing bloggers have to offer. I love this fall collection of back to school recipes. I’m going to enjoy perusing these delightful offerings for our own empty nester dinners and lunch box entrees. 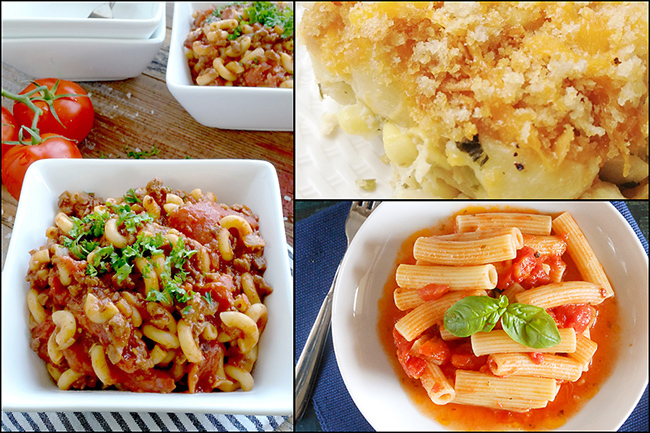 Thank you for including Homemade Food Junkie’s Twisted tuna Casserole in your line up. We love that cheesy crunchy pasta casserole for cool fall nights. 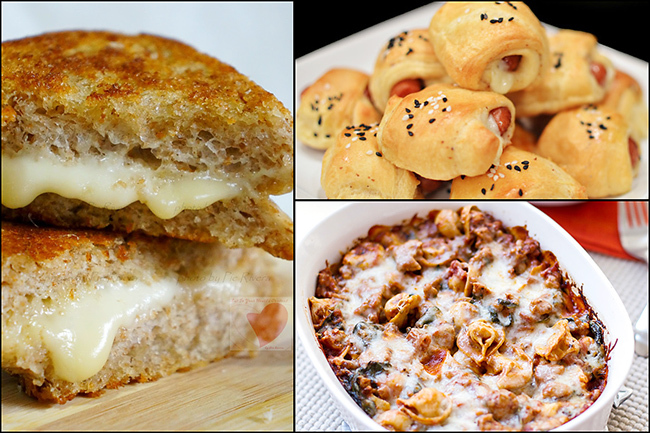 Pinning and sharing this recipe round up! All of these looks so wonderful, and I can’t wait to give them a try. Looks like some good ole’ comfort food to me. 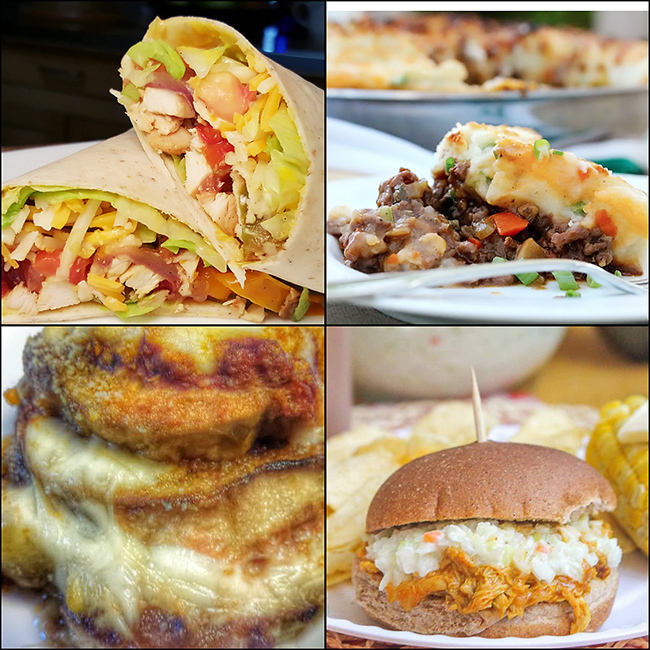 Thanks for including my Chicken Fajita Wraps! Love the roundup! I appreciate the feature!! 😉 Lots of great links here!! Thanks so much for the share! Gorgeous post with so many amazing recipes! Pinned!